I am always on the lookout for crock pot recipes that have basic ingredients that I usually have on hand. There is something almost magical to me about coming home and smelling a home cooked meal that is almost ready to be enjoyed. Btw, whoever invented the crock pot is a genius! Anyhow, I stumbled upon a website recently that has a ton of interesting looking recipes and to my joy, a lot of crock pot recipes, and wanted to share. If you try something off of their site please comment back to me and let me know your thoughts. 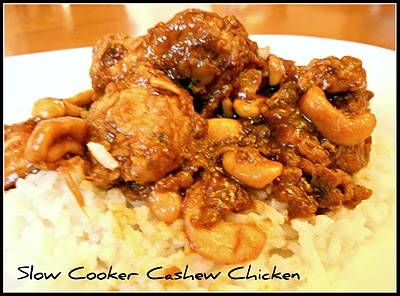 I am planning on trying their slow cooker cashew chicken, YUM! I usually wind up substituting certain ingredients on a recipe either for health conscious reasons or just because I don't like a certain ingredient. I also tend to add to recipes as well. Enjoy!